Sometimes it happens that we get an amazing idea for our new website and we set it up quite excitedly. We also work on it for sometime but then we suddenly lose interest in it or get busy in some other things. So what do you do in such situations? Well, the easiest and best thing to do is to sell the website to someone else. But now the big question is where to sell or buy sites? To help you out in this situation, today we have a list of 10 Awesome Places to Sell Your Website. Check the list out! This website specializes in accomplished and start-up websites. The cost for an established websites’ 2-week listing is $59, or $99 for a two-month long listing (free extension for one month, for a total of three months) and your website will be featured on the front page. The cost for the start-up sites is also the same, but are not featured on the front page. 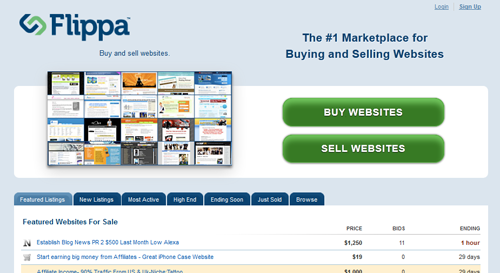 Flippa.com is the ultimate place for buying and selling web sites. They have already sold $25 million websites. It boasts a great interface, a powerful search feature and a slightly different fee structure i.e cost for listing your site is $19, with a 5% success fee. The thing that makes it stand out from its competition is its verification features, such as phone number verification and verified Google Analytics traffic stats. This thing helps increase average selling prices. Mostly serious buyers come to this site who are ready to pay handsome amounts for a good website. This is a forum where you can post a website for sale. But there are some conditions too: you must have been a member for at least 14 days, you should not have a reputation in the red and must have a minimum of 25 posts throughout their boards. This is another forum where you can post your website for sale. It will cost you $9.95 per topic, but you must be a member in good standing with the forum. InternetCompanyForSale.com does not charge any commissions on the sales, but they only charge once and that is the one time listing fees depending on the kind of website you want to sell. 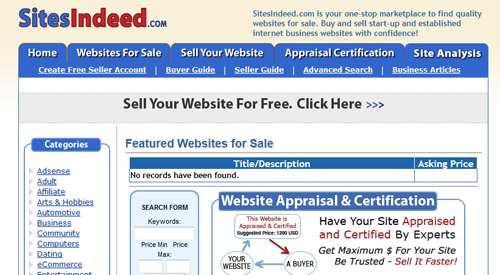 The cost for established websites is $59.95 for list-til-you-sell and its $39.95 for start-up websites. A permanently featured Listing will cost you $99 for either type of website and you will also be featured in their bi-weekly newsletter. This site provides basic listing ads without any charge for up to 90 days, but you will have to pay a fee if you wish to extend your listing past that time. The fee will depend on the number of days you select. You can also get to be in the featured listings by paying a fee for it, depending on the number of days you want to list it. This forum is about developing your own websites and domain names etc. 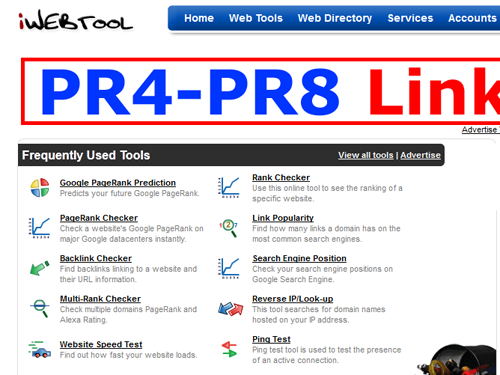 It also boasts a sales area for selling domain names, sites and scripts etc. This is the site that lets you do anything and everything — from promoting your services to selling your established websites. General listing is free of cost, but things like promotions etc will cost you credits you buy with the website. With auctions, you have the ability of selecting to feature it on the main page, highlighting it, etc., and you would have to pay for each of those services. This website has a fee of only $5 for listing your site, but one downer is that it is not very browsing friendly. When someone clicks on the link to purchase a website, the site asks them to search on keywords instead of just allowing them to browse the presently available listings. 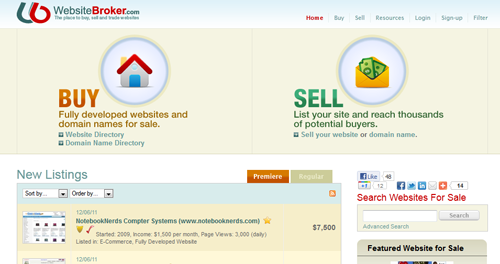 This website lets you sell both, the domain names and a complete web sites. The cost for getting listed for 90-days is $9.95, or $29.95 for a premium listing that gets your website extra exposure. Domain names also have the same kind of auctions, standard listing costs $9.95 and premium listing costs $14.95. No commissions are charged on completed listings. TradeYourWebsite.com is a #1 market place to buy/sell domains and website in Italy. Since 2011 a english version is online.